Stranger Worlds: Art Tuesday: Poetry. Hello there. How's everyone's August going? Today I'm going to fangirl over Ted Hughes share some more scrapbook pages with you (but I am also going to fangirl over Ted Hughes). Do you remember this post, where I shared some pages of cards, tickets, drawings etc.? Well, also in my scrapbook I write out poems and quotations that I like, and that's what we've got today. 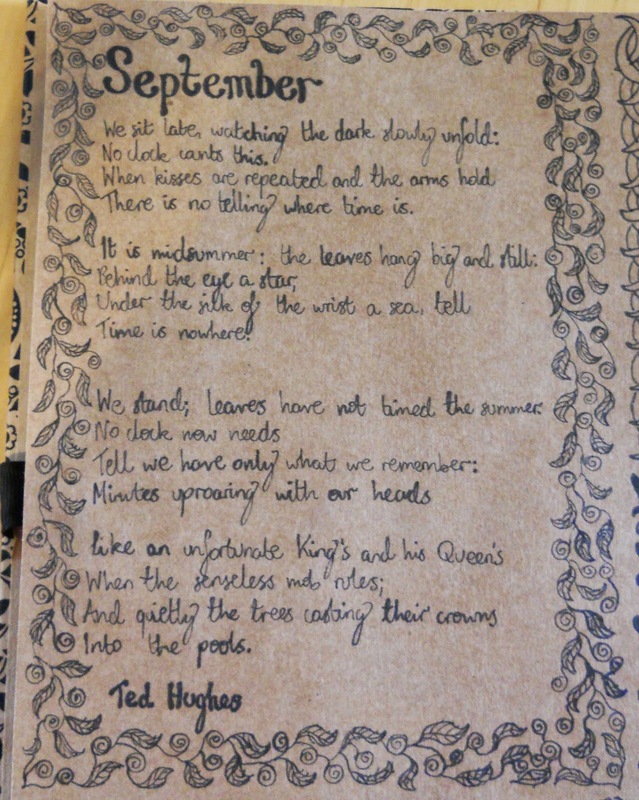 September by Ted Hughes - one of my favourites of his, which is saying something. I love Ted Hughes a lot - his work is absolutely stunning and perfectly captures so much. Sorry if this is too small - click here for a web version. My favourite lines: Behind the eye a star / Under the silk of the wrist a sea, tell / Time is nowhere. LOVE THIS POEM. So insightful! Another Ted Hughes favourite. THIS. This is more of a fragment than a poem, but all the same I love this two lines - I think they're very evocative. at 60 miles a decade. on her naked skin as she pulled off his shirt. and the moon seems too old to care. when she let him wander through her memories. when he kissed her, he kissed privileged. and wine from her own breath. he watches her, without moving. and his chest is like marble in a Parisian museum. and he kisses by the public school book. The girl who wrote this, Hattie Gruneworld, wrote it to enter the Foyle Young Poets Award (she was one of the winners, needless to say). Which is awesome for her (but depressing for other teenage poets, who read this and think "oh. And then there's me.") Isn't it incredible that a teenager wrote that beautiful poem? It blows me over. So, what did you think of these poems? Do you have a favourite poem/poet? Tell me your thoughts! Art Tuesday: I draw people? ?